Our association Triomphe de l’Art, asbl warmly thanks the COCOF for supporting the International Music Competition Triomphe de l’Art! Thanks to grants from the COCOF, our association will offer new prizes and interesting projects to the participants of our contest! Rose d’Anvers awards a special prizes at the 4th International Music Competition Triomphe de l’Art . Rose d’Anvers, rose and diamond, stunning symbols of nature’s talent for creating two of the most beautiful icons in the universe. Rose, soft, scented, delicate, alluring, enchanting. Diamond, brilliant,scintillating,enduring. Rose d’Anvers was created in Antwerp, for a millennium a pulsing, pioneering port city and Europe’s heart of culture, learning, painting, and printing. For thousands of years roses and diamonds have captured the imaginations of men and women and inspired and uplifted their senses.A rose, superb in its natural beauty and understated elegance, traces mother natures’ delicate signature of swirling petals. A diamond is nature’s maestro of light refraction and fire.For centuries, sacred, symbolic, interpreter par excellence of Antwerp’s exquisite craftsmanship, scintillation, and brilliant light refraction.In a world marked by change and challenged by disruption, Antwerp’s Rose d’Anvers connects the eternal truths of integrity, beauty and resilience and the people who uphold these values. 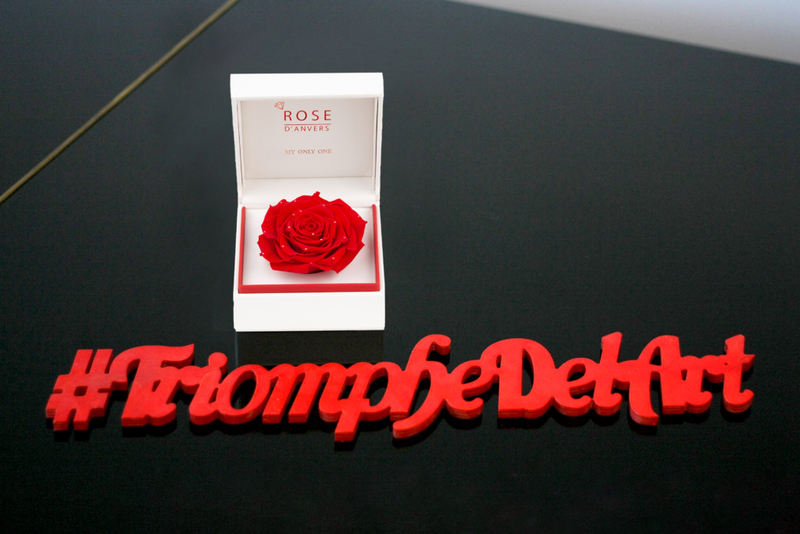 Rose d’ Anvers sublime symmetry symbolizes reciprocal respect, love, and the recognition of each person’s safe space and security. Rose d’ Anvers, a duet fo the rose, royal representative of nature’s floral treasury, and diamond, peerless pinnacle of nature’s synthesis of heat, pressure and the volcanic velocity of the primal elements. Confronted with today’s hijacking of humility, respect and love by greed, egoism and aggression, Rose d’Anvers celebrates and connects those with grace, gratitude and generosity of spirit. Arinkasoap awards a special prizes at the 4th International Music Competition Triomphe de l’Art . These are an amazing beauty baskets all made in soap. JEWELLERY DESIGN ARENA AGADZHANYAN awards a special prize at the 4th International Music Competition Triomphe de l’Art . This is an extraordinary beauty G key made in silver. 150 euros in 2nd age group. Applications for the IV. International Music Competition Triomphe de l’Art are open! 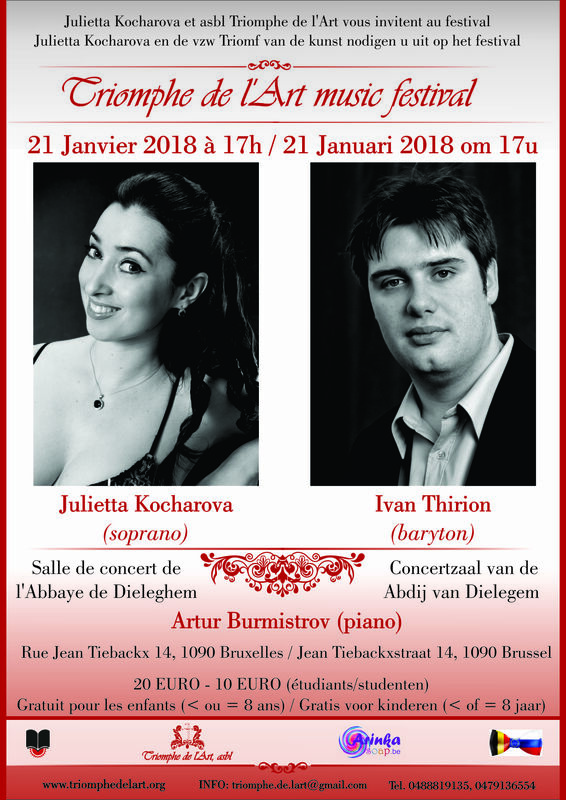 We will be happy to see you on the rounds and Gala concert between 19 and 24 November 2018 in the Big Hall of Royal Conservatory of Brussels! Ivan has also been a very active concert singer and recitalist and performed in Belgium, France, Netherlands, Switzerland, Italy, Bulgaria, Georgia, United States and Russia. He is a laureate of many International Competition. In June 2017 he was representing Belgium in the final of BBC Cardiff Singer of the World 2017 Competition, becoming the symbol for the young generation of Belgian opera singers. 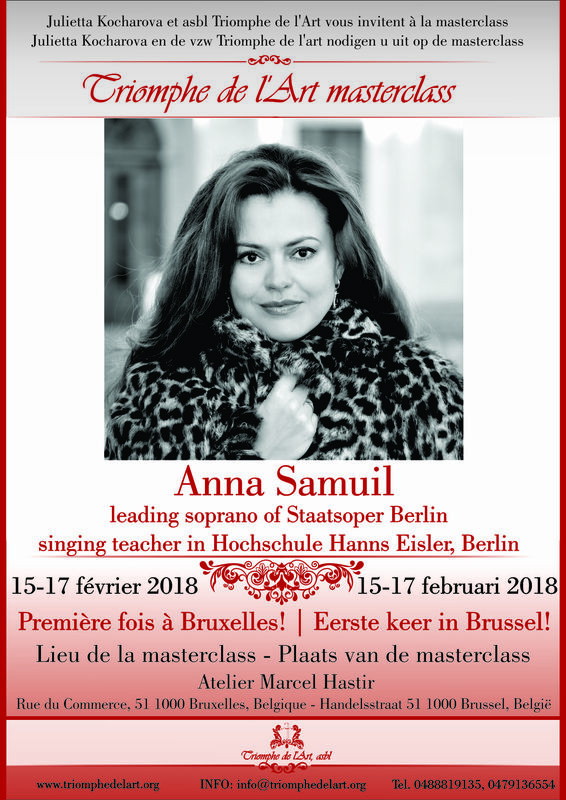 The concert will take place at l’Abbaye de Dieleghem, Rue Jean Tiebackx 14, 1090 Brussels, Belgium on 21 January 2018 (Sunday) at 17:00.
INTERNATIONAL INTENSIVE VOCAL MASTERCLASS “TRIOMPHE DE L’ART” on 5-6 January 2018. This masterclass is given by the amazing vocal teacher Belgian Maestro Daniel Ottevaere. Hurry up to apply! The number of places is limited! Daniel Ottevaere was born in Brussels. He studied singing, lyric art and melody in Brussels, in Vienna and in Castelfranco-Veneto in Italy. Then, he settled in France (Paris and then Lille) and for four years, he has studied at the School of the Opera Paris. He started learning with (his teacher) José Van Dam a few years ago and still is. Daniel Ottevaere is really concerned with passing on his knowledge. 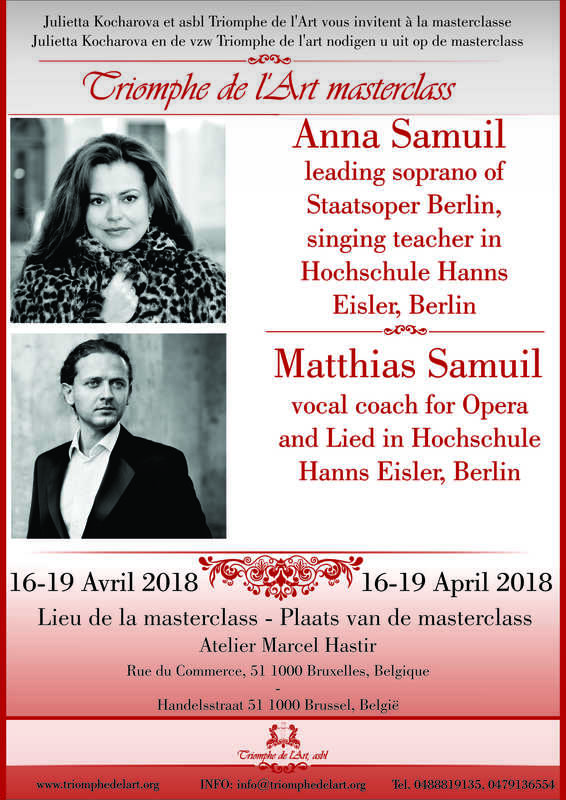 That’s why he is a singing teacher at the Ecole Normale de Musique in Paris, at the Chapelle Musicale Reine Elisabeth in Brussels (with José Van Dam) and at the Valenciennes Conservatoire. Recently, he was giving singing lessons on France Musique during Stéphane Goldet’s programme, “l’Atelier des Chanteurs”). Applications for the III. 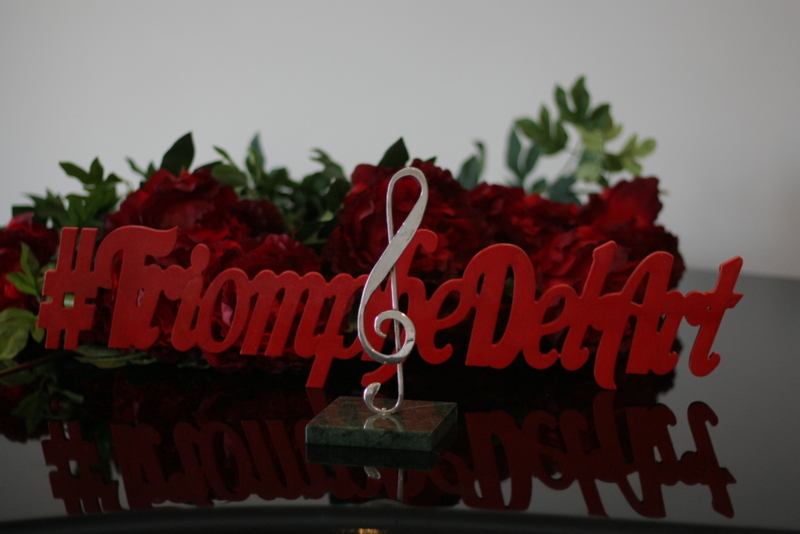 International Music Competition Triomphe de l’Art are open! We will be happy to see you on the rounds and Gala concert between 6 and 11 November 2017 in the Big Hall of Royal Conservatory of Brussels! 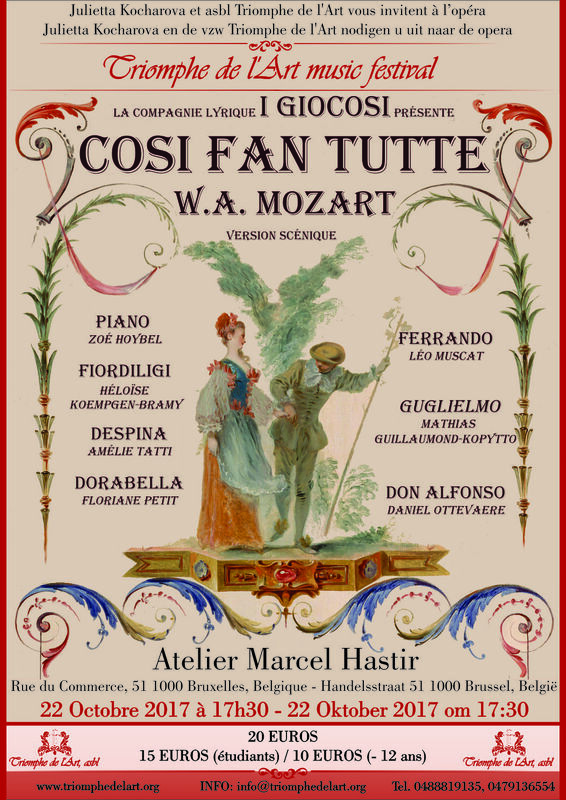 Triomphe de l’Art, asbl and I Giocosi have pleasure to invite you at the opera « Così fan tutte » of W.A. MOZART with piano accompaniment. 3 hours of opera with break, ensured by a casting of selection in the heart of European quarter of Brussels. The concert will take place at l’Atelier Marcel Hastir on 22 October 2017 (Sunday) at 17:30. Presale is available till 18th of October 2017!!! Limited number of seats. Hurry up to book tickets! INTERNATIONAL VOCAL MASTERCLASS “TRIOMPHE DE L’ART” between 23 and 28 October 2017. 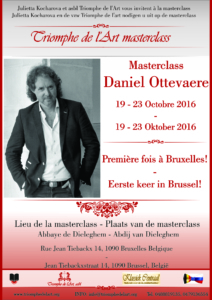 This masterclass is given by the amazing vocal teacher Belgian Maestro Daniel Ottevaere. Hurry up to apply! Applications for the II. 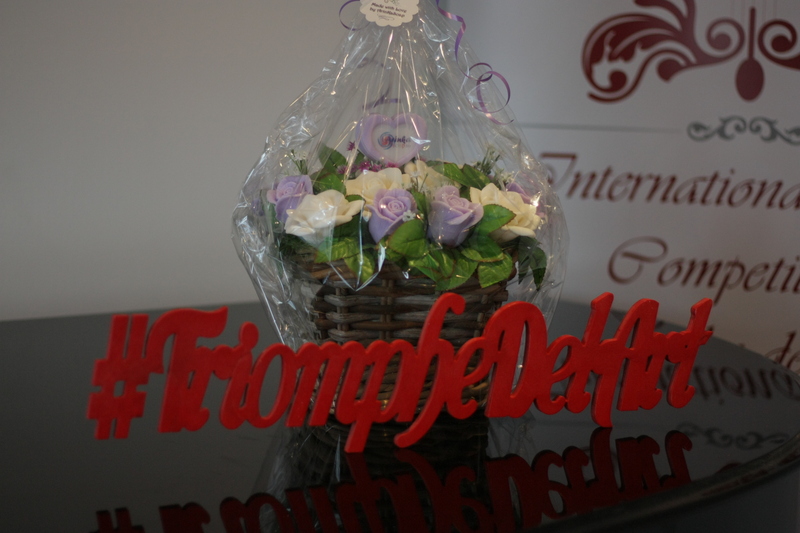 International Music Competition Triomphe de l’Art are now closed! We are happy to announce that the competition is full. 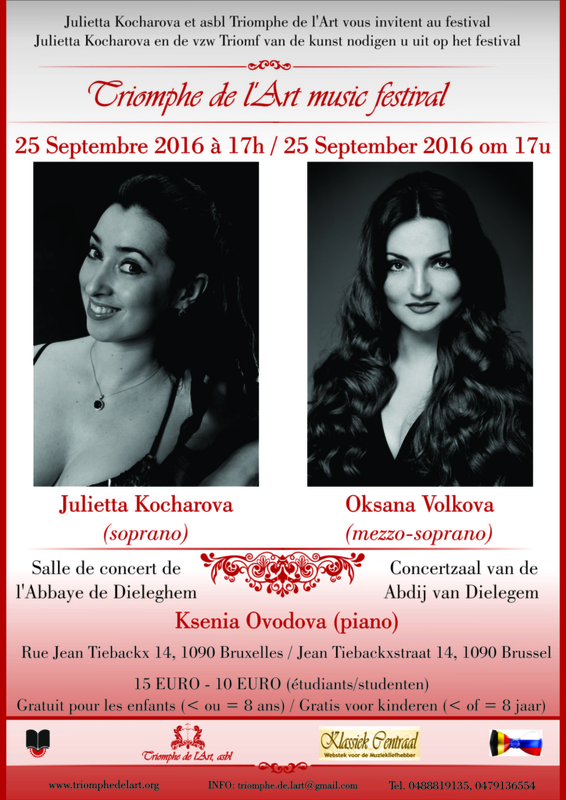 Do not miss the opportunity to hear for the first time in Belgium the star of the world opera, Oksana Volkova (mezzo-soprano). 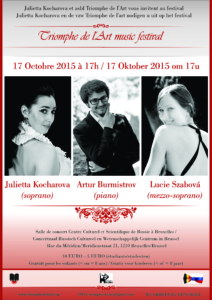 INTERNATIONAL VOCAL MASTERCLASS “TRIOMPHE DE L’ART” between 19 and 23 October 2016. This masterclass is given by the amazing vocal teacher Belgian Maestro Daniel Ottevaere. At the end of the masterclass (evening of 23 October 2016) there will be the final gala concert of the participants. Hurry up to apply! Amazing news! We are glad to inform you, that the Grand Prix in the 1st age group (young hope of 15 – 19 years ) at the 2nd International Music Competition “Triomphe de l’Art” will be offered by the famous young opera diva Aida Garifullina. Aida Garifullina is the leading voice of the Vienna State Opera. She regularly has recitals in Vienna and London, as well as participates in joint concerts with Plácido Domingo, Andrea Bocelli, and Dmitri Hvorostovsky, etc… Aida won the First Award of Plácido Domingo’s International Opera Singers Competition Operalia-2013 held in Verona. She is one of the most demanded young sopranos worldwide. Tenderness, softness, warmth and depth make her voice today unmistakable. Its implementation always has an inherent impeccable taste, sense of style and restraint and severity in the expression of feelings, caused by its mentality. All of the above, in combination with her external beauty, youth and charm make her executable images, sometimes, simply irresistible. Hurry up to apply for the competition. Only 20 places left! 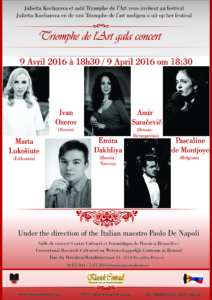 Do not miss a unique concert “VIVA l’OPERA” with the participation of the young and talented singers Pascaline de Montjoye(Belgium), Ivan Ozerov(Russia), Emira Dakhliya(Russia / Tunisia), Amir Saračevič(Bosnia-Herzegovina), Marta Lukošiūtė(Lithuania) and others under the direction of the Italian maestro Paolo De Napoli. They will present you the masterpieces of the world classics. Wherever Paolo De Napoli travels, he is followed by his students from Italy, Germany, Austria, Baltic countries, the Czech Republic and Slovakia, Russia, Croatia, and Argentina, including the principals from Staatsoper Munich, Paris Opera, Glyndebourne, Teatro Real Madrid, Berlin Staatsoper, the Metropolitan Opera in New York, and other theaters. Paolo De Napoli has been engaged for vocal and repertoire coaching by opera houses in Moscow, St. Petersburg, Novosibirsk, Tokyo, Riga, Tallin, Vilnius, Minsk, Zagreb, and others. He has been working with Czech opera houses in Prague, Brno, Ostrava since 1996. He was an Associate Professor of voice with University of South Carolina in the USA, lead classes with Cortona and Anghiari Summer Opera Studios. Presently, Paolo de Napoli has been engaged as an artistic advisor to Riga Opera, and the the director of vocal studies at the Japan Art Society of Tokyo leading regular masterclasses there. 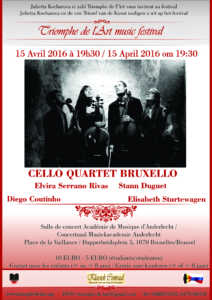 Triomphe de l’Art Music Festival is delighted to invite you to the concert of BRUXELLO Quartet on 15 April 2016 at 19:30 in Muziekacademie Anderlecht by address Dapperheidsplein 5, 1070 Brussel (metro Saint-Guidon). It is composed of four young and dynamic cellists of 4 different origins for an eclectic repertoire of their image. Diego Amaral Coutinho comes from Brazil, Sturtewagen Elisabeth from Belgium, Elvira Rivas Serrano from Spain and Stann Duguet from France. They met here in Belgium at the Brussels Royal Conservatory. BRUXELLO was born spontaneously by the pure pleasure of playing together and the desire to share that energy and their love to cello with the public. It transports the listener on a journey where the melodies and rhythms mix with each other bringing magic. Their repertoire is very broad: it ranges from the baroque and classical music to modern and jazz music. It is also very varied, they are of 4 different origing, that allows them to share and discover other musical cultures including Brazilian music and Tango. They can also surprise the public with Rock and Metal music, for example the group Apocalyptica. They also make their own arrangements of parts they want to interpret. 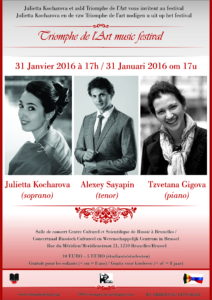 On 31 January 2016 at 17:00 the 3rd concert of the 2nd International Music Festival “Triomphe de l’Art” with Alexey Sayapin the amazing tenor from Germany, leading soloist of Aalto Essen Opera Theater and Philharmonic; artistic director of “Triomphe de l’Art, asbl” Julietta Kocharova; virtuoso pianist from the Brussels Conservatoire, Tzvetana Gigova.It’s a unique opportunity to hear Alexey Sayapin in Belgium. He is a winner of many prestigious international competitions such as the Luciano Pavarotti International Tenor Competition, the Galina Vishnevskaya Competition and the Elena Obratsova Competition. He was personally selected by Placido Domingo to appear in his OPERALIA competition and became his student in the Young Artists’ Program at Los Angeles Opera for the 2010-12 season. In United States Alexey performed on many stages including Los Angeles Opera, Santa Barbara Opera and Aspen Summer Festival. In 2013 Alexey returns to Europe where he successfully debuts in the theater of Aachen (Germany). He sings in Berlin with a concert “Requiem” by Giuseppe Verdi, in memory of victim whom was killed in the Holocaust. Since the autumn of the same year he became a leading soloist of Aalto Essen Opera Theater and Philharmonic. For the first time, “Triomphe de l’Art, asbl” opens its festival with an exhibition of the outstanding painter from Luxembourg, Yana Kapoustina. You can enjoy the various paintings created in a post-impressionist style. But you can also discuss and share your impressions and emotions with the painter. The exhibition will open on 17 October at 15:00. After the exhibition, we invite you to the art of music. “Triomphe de l’Art” festival’s opening concert with the participation of “Triomphe de l’Art, asbl” artistic director Julietta Kocharova (soprano) and Slovak opera singer with a unique voice by its beauty and its timbre Lucie Szabová (mezzo-soprano) and talented young pianist Artur Burmistrov (piano). The concert starts at 17:00. The program will include arias and duets from operas of the greatest geniuses of classical music (Verdi, Mozart, G. Bizet, C. Saint Saens, Dvorak, P. I. Tchaikovsky, Catalani, Lehar, etc.. ).